If there is one thing ( let me make that two! and I’ll talk about the second one in a later post) I have a weakness for, it is soaps. Yes, I totally love them and when I walk into a lifestyle store that sell soaps, I try and veer away from that aisle because I just end up buying lots of them! But one thing I need to add here is that I love pure and organic soaps. Fab India, Soulflower, Holy Lama, Lush are some of my favourites. Today, I am going to review some of my favourite soaps from Fab India. There are 4 soaps that I really like from FI. 1. Spice Soap : This comes as an individual as well as a pack of three. I always buy a single because I am eager to change my soaps as soon as I can. This soap has an inbuilt scrub that exfoliates your skin as you use it. What I like about this soap is that the scrub lasts right till the end. I like the spice fragrance that lingers on at least for half the day after I have bathed with this. This soap lasts roughly about 20 days if used regularly. I avoid using this in the winter as it tends to make my skin dry, for the rest of the year, yes, this soap is a must use on my list. If you took out packing, you would see a sea weed kind of thing in the soap that acts like the loofah. 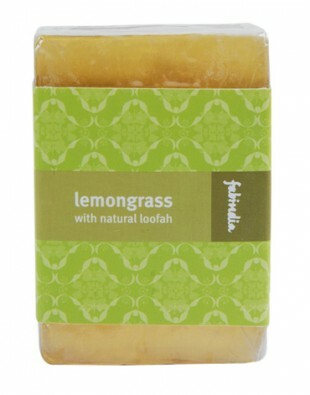 Lemongrass is known for its anti-septic and anti-inflammatory properties, and with the loofah combined, it also helps exfoliate the dead skin. The fragrance is mild but that is what I like about it. It’s almost like a game of hide-and-seek, sometimes you smell it and sometimes you don’t! Invigorating and exfoliating soap made using refreshing lemongrass oil and wild torai loofah. Ingredients: Purified Water, Soap Noodles, Sugar, Glycerine, Sodium Lauryl Ether Sulphate, Lemongrass Oil, Cocoamido- propylbetaine, Sodium Palmitate, Sodium Stearate, Wild Torai Loofah. I love this soap for its minty fragrance. It never fails to invigorate me. Its a perfect soap to kick start your day or end your day. A hot shower and the soap never fails to relax a tired me. Yet again, like most of the FI soaps, this soap also has a lovely fragrance that lingers for a long time. I love the colour of the soap. It is a lovely clear green. Cooling and reinvigorating soap made using peppermint oil known for its refreshing and antiseptic properties. Unwind after a long day with this rejuvenating soap. Ingredients: Sodium Laureth Sulphate, Cocobetaine, Saponified Castor Oil, Cotton Seed Oil, Coconut Oil, Glycerine, Propylene Glycol, Sodium Stearate, Sodium Laurate, Peppermint Oil. This was one of the first soaps I had tried from FI. I liked it so much that I bought half a dozen of these soaps and gifted them to some of my friends. The soap has a nice scrub to it. You can use the soap to lather up and there is a scrub on the other side that can be used to exfoliate the dead skin. 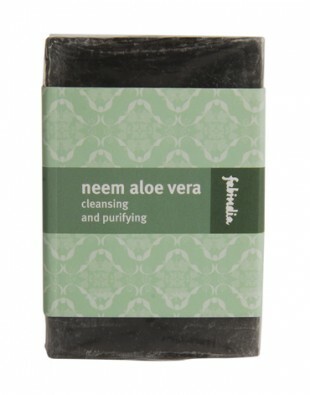 The scrub contains a good portion of dried neem powder which cleans your skin very well. Cleansing and purifiying bathing bar with a combination of walnut shell powder, neem powder, neem oil , aloe vera and basil oil. Ingredients: Soap Base (Sodium Cocoate, Sodium Stearate, Water, Propylene Glycol, Sugar, Sodium Lauryl Ether Sulphate, Sodium Chloride, Disodium EDTA and BHT), Walnut Shell Powder, Neem Powder, Neem Oil , Glycerine, Castor Oil, Aloe Vera, Basil Oil. 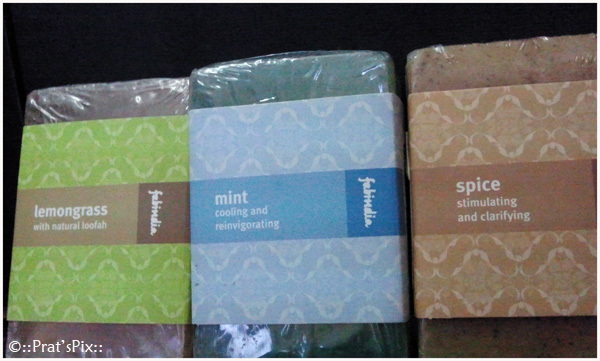 Note: The individual pics of the soaps have been taken from the FabIndia website. Traditional herbs like aloe vera and others are some alternative and cheap way to treat your illness, i have take it and the effect is as good as the modern treatment ones. Thank you for the TS for the good information you have here ! ihave bookmarked this site and will come back for sure !